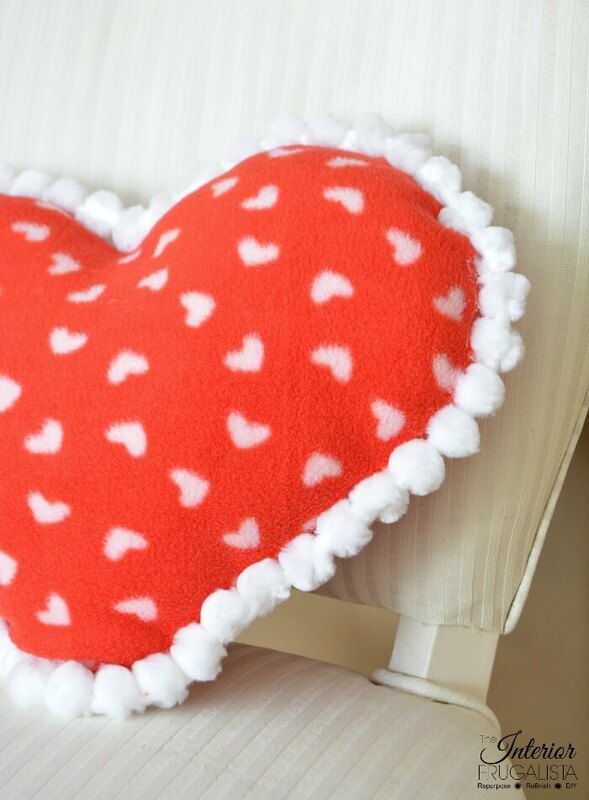 If you can sew a straight line, then you could easily make this adorable Valentine Fleece Heart Pillow and it'll only take you about 15 minutes to make. It's a great way to use up fabric remnants that you may have on hand. You don't need a sewing machine to make this pillow but it is a lot quicker if you do. 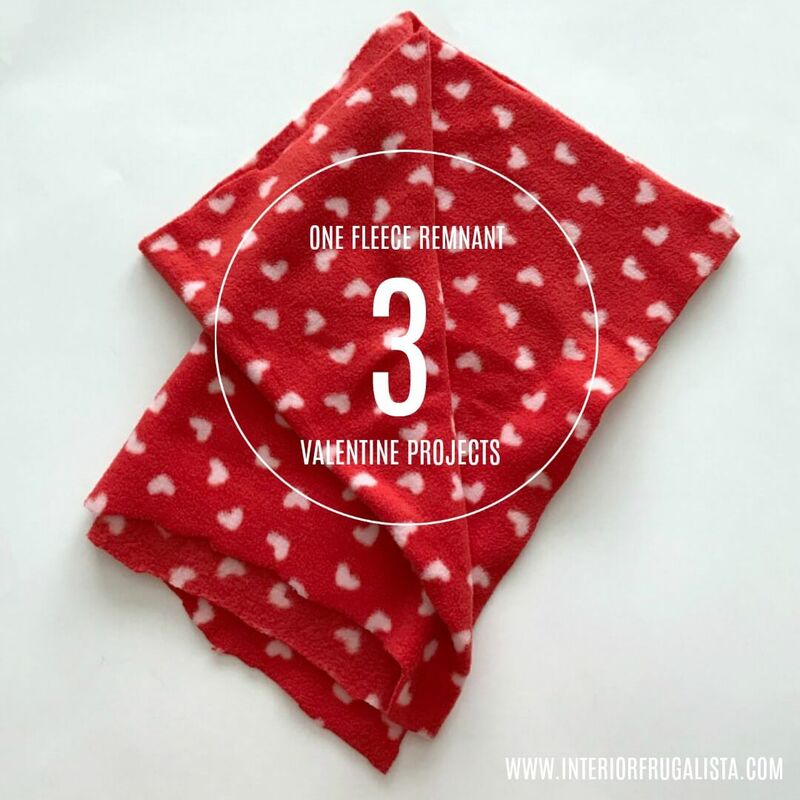 It all started with this fleece remnant that I found in my fabric bin. I think it's leftover from a project my daughter made in high school and she's now married with two children. That tells you how long it's been sitting in the bin. 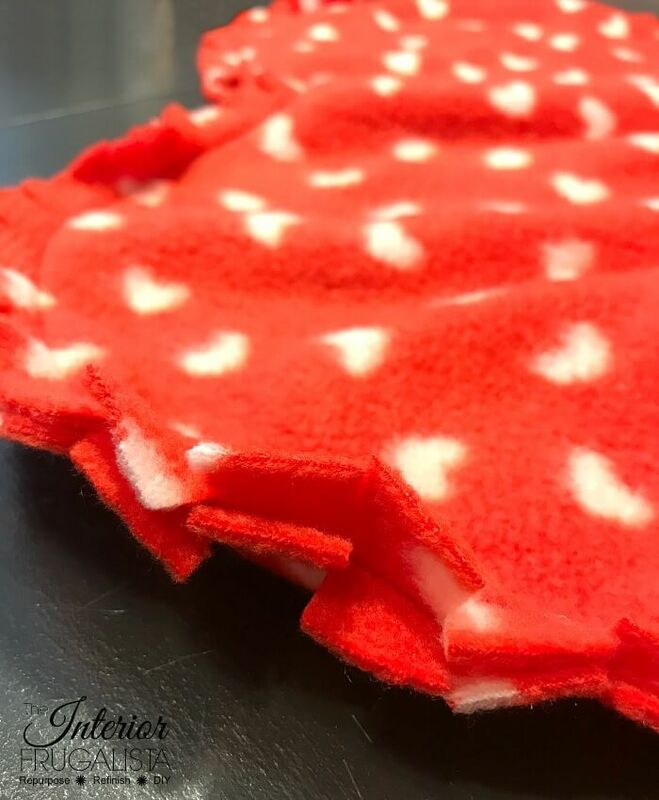 Over the next week or two, I'll be sharing three Valentine ideas made with this one red and white heart fabric remnant. 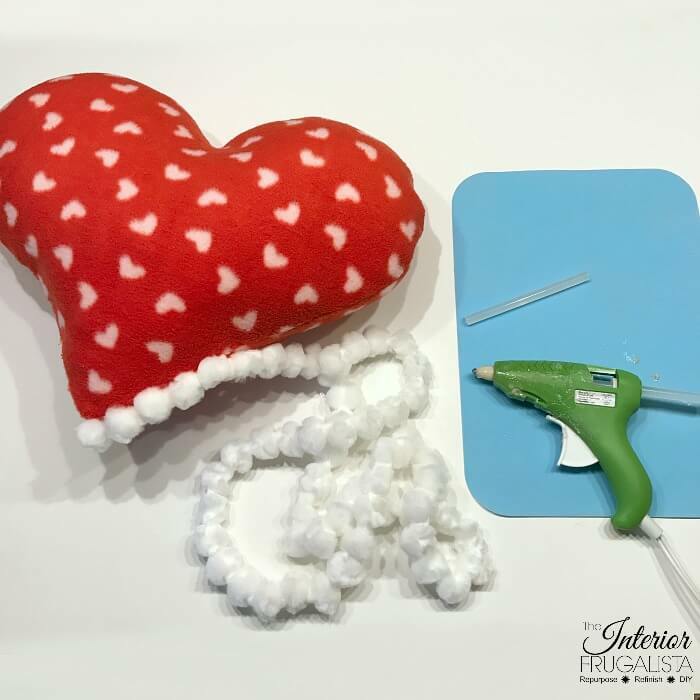 But for now, we'll focus on how I made the heart pillow. 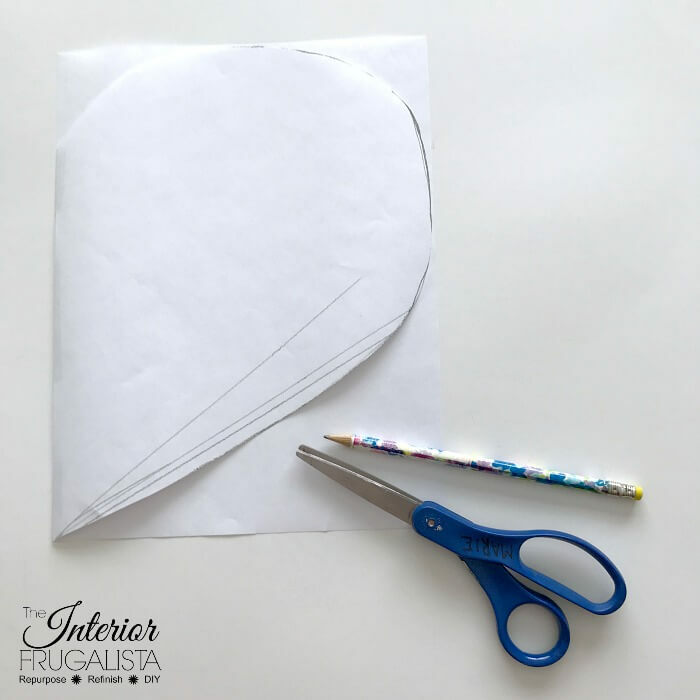 As you can see in the photo below, you don't need many supplies to sew this pillow. Before we get into the tutorial, I should mention that this isn't a professional sewing tutorial. I am a self-taught novice behind the sewing machine. I made a makeshift sewing pattern and figured out how to make the pillow as I went along. Which is a testament to how easy this pillow is to make. First, we need a heart pattern. I drew just one half of a heart freehand on a sheet of letter size bond printer paper. Note: I haven't included a seam allowance on the pattern. You can add one before cutting your heart but I added mine as I cut the fabric (you'll see how in Step 3). I folded the fabric, the wrong side facing out, towards the center on both ends to form the fold for both the front and back pieces (pictured below). 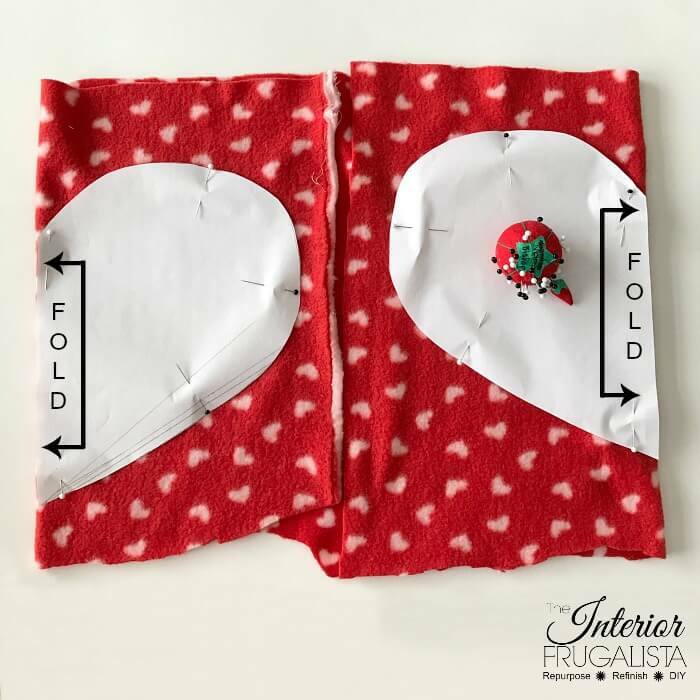 Pin the pattern onto the fabric with the center of the heart on each fold. I added a 1-inch seam allowance by sliding a ruler along the heart pattern and cutting as I went (pictured below). 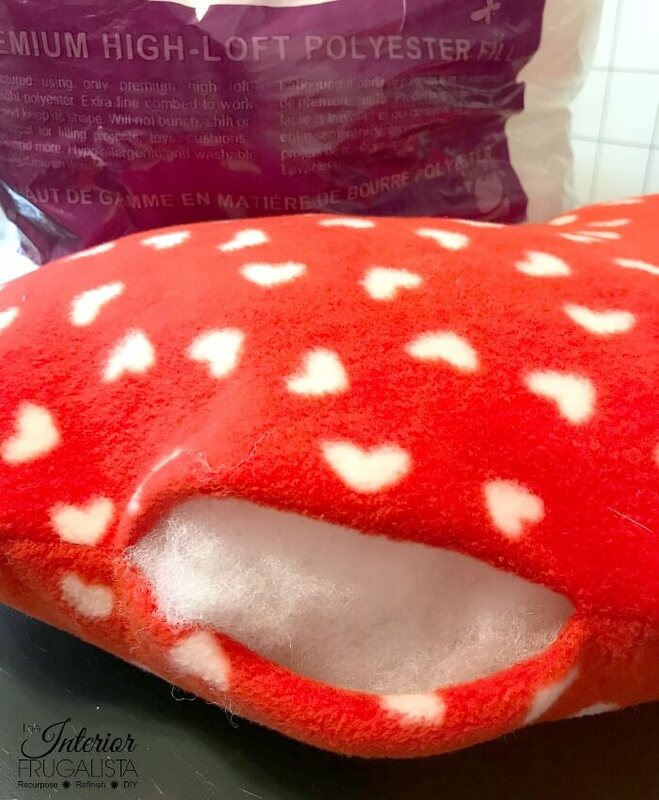 As mentioned in Step 1, you can add the seam allowance to your pattern before you cut out the heart if that is easier. I wanted the heart as big as I could get it on letter sized paper so I had no room left to add a seam allowance. With good sides together, pin the front and back pieces together. Make sure to mark a 4-6 inch opening for adding polyester fill later. I marked my opening with double pins on each end. I cut the fabric with a 1-inch seam allowance but actually sewed the pillow with a 5/8-inch seam allowance. Only because it is an easier guide on the sewing machine plate AND it made the pillow a little bigger. If you don't have a sewing machine, you can stitch this pillow by hand with a short running stitch. It wouldn't take very long for a pillow this size and it's a good task to do while watching your favorite television show. If you’re like me and at a certain age where threading a needle causes colorful words to come out of your mouth is a challenge, you may find this tip VERY helpful. 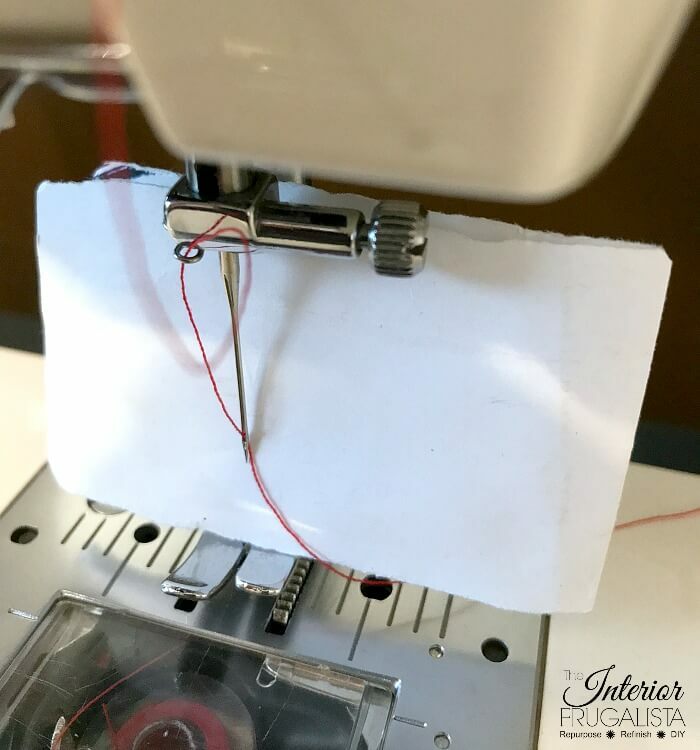 Hold a piece of white paper behind the sewing needle and the eye of the needle will magically appear before your very eyes! I always keep this little piece of paper in the storage compartment of my machine and another in my sewing basket. 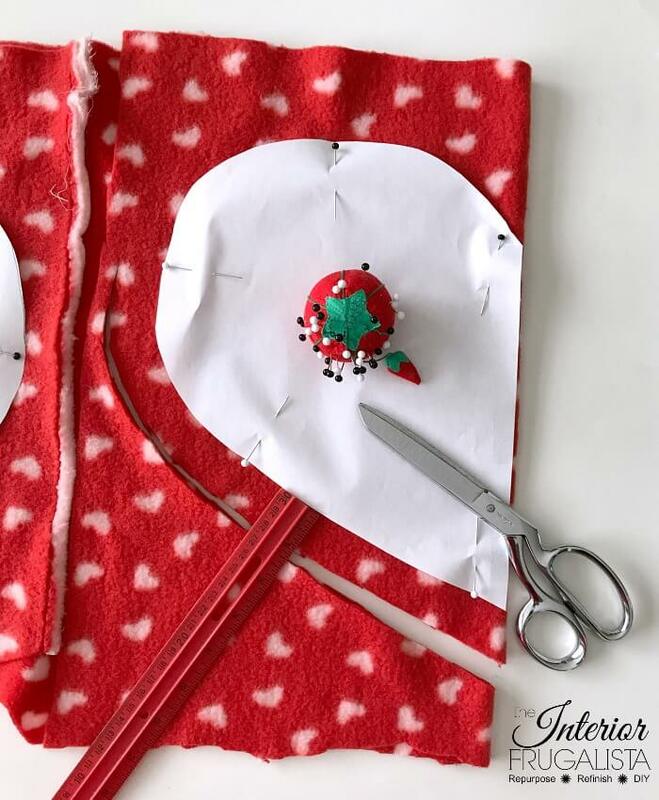 To remove bulk around the curves of the heart, clip straight lines perpendicular to the seam, making sure you don't clip too close to the seam (pictured below). 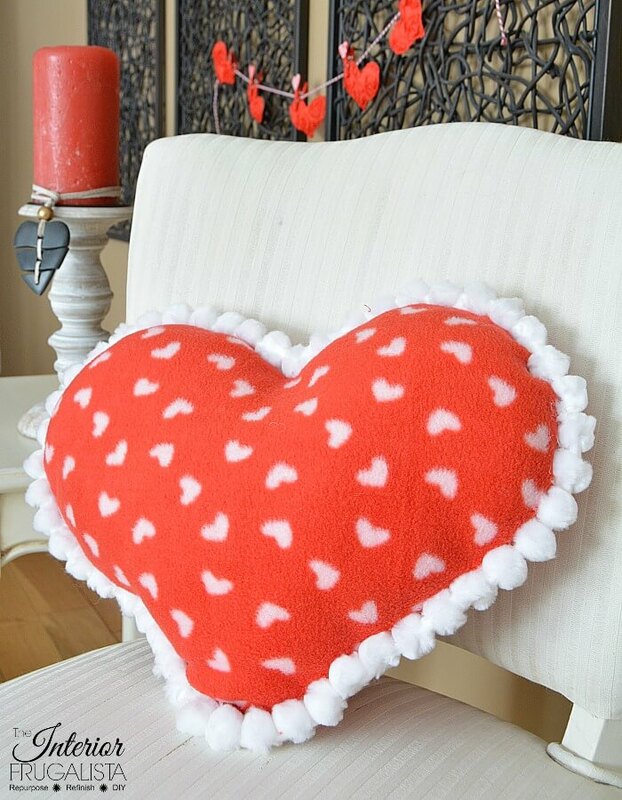 Turn the heart pillow right side out pushing the bottom point out with your finger. Fill the pillow with polyester fill. I used what I had on hand. 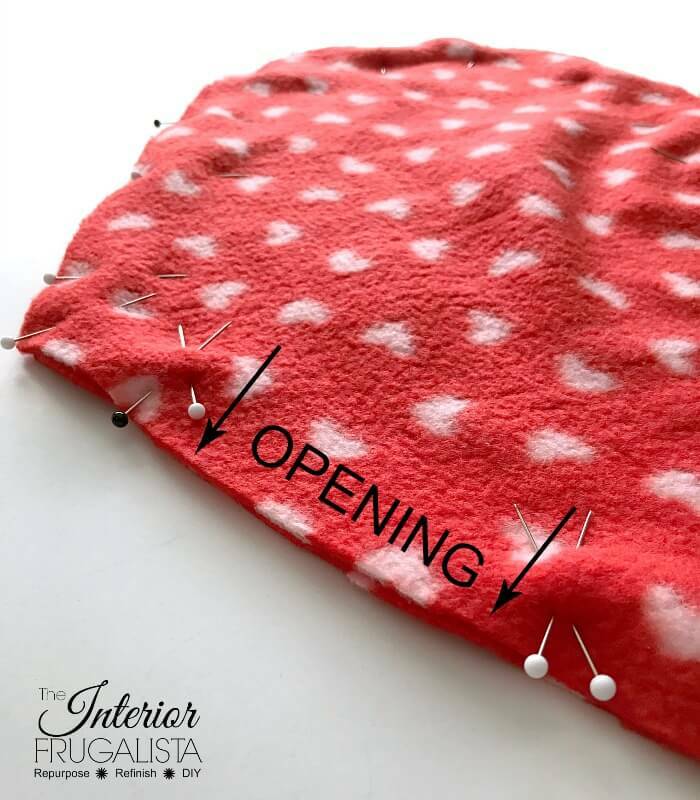 Fold in the seam allowance on the opening and pin closed. Hand stitch the opening closed with an invisible stitch called a ladder stitch. If you're unfamiliar with this stitch I found a great ladder stitch video tutorial on YouTube that you may find helpful. I used white craft pompoms meant for attaching with a hot glue gun. There are pompoms available with a trim meant for sewing them inside the seam but we're going to keep things simple for this pillow. Just run a dab of hot glue over the seam beneath each pompom. Easy peasy! 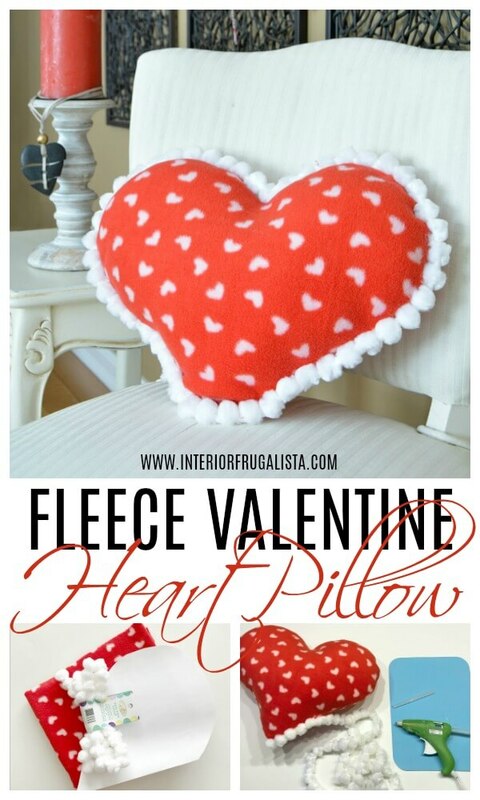 That's it, fifteen minutes later and we have a cute fleece heart pillow for Valentine's Day. 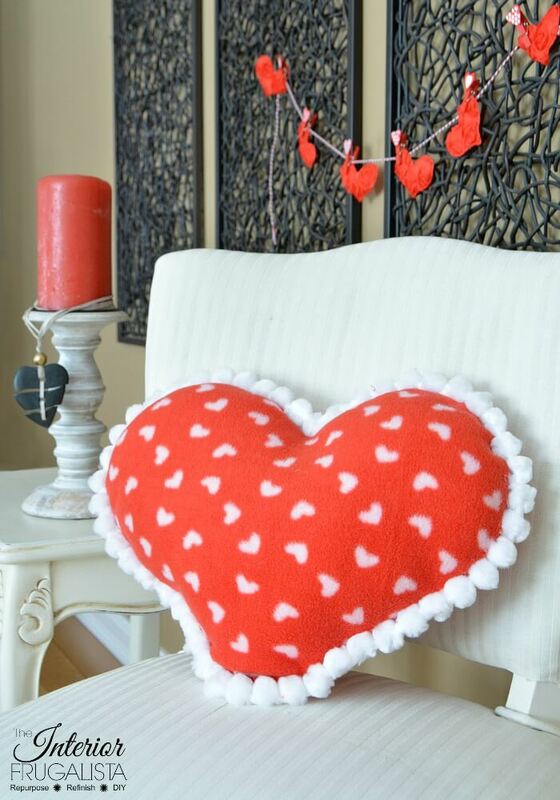 Are you all about the hearts when decorating your home for the occasion? If so, you may like these two heart shape wreath ideas. One is an Easy DIY Red Scarf Wreath and the other a Red Burlap Ribbon Wreath. 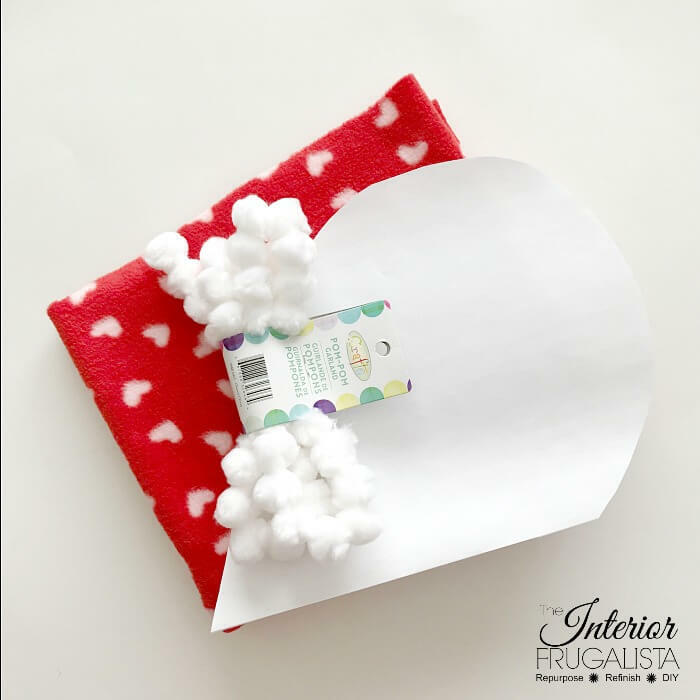 I share other Valentine DIY ideas on my seasonal Valentine's Day Page on the blog or my Be My Valentine Board on Pinterest.